Every mining subsector has its unofficial leader. It’s that company — usually with the largest market capitalization — that has arguably the best combination of top mineral deposits, superb operations, savvy management, high-quality workers, technical excellence, welcoming jurisdictions, a stable balance sheet and steady cash flow. And that is what’s particularly distressing about the revelation in mid-November that uranium’s undisputed leader Cameco is suspending operations in northern Saskatchewan at its world-class McArthur River uranium mine and Key Lake mill that processes McArthur River ore. Key Lake is the world’s largest high-grade uranium mill. Cameco owns 70% of McArthur River and 83% of Key Lake, and is operator at both, with France’s Areva owning the rest. Together, the operations produced 11.1 million lb. uranium oxide in the first nine months of 2017. And this won’t be a Sudbury-style forced extended summer vacation for workers: operations will be suspended at the two facilities in January 2018 and stay suspended for at least 10 months. The workforce at the two operations will drop temporarily by 845 workers (560 employees and 285 contractors) while 210 workers (160 employees and 50 contractors) will maintain the idled facilities at a cost of around $7 million per month. There could be more layoffs in the Saskatoon head office in positions that support the suspended operations. The bottom line is that Cameco is suspending 40–45% of its mine output and laying off 20% of its workforce. Cameco is also slashing its annual dividend by 80% next year from 40¢ to 8¢ per common share. 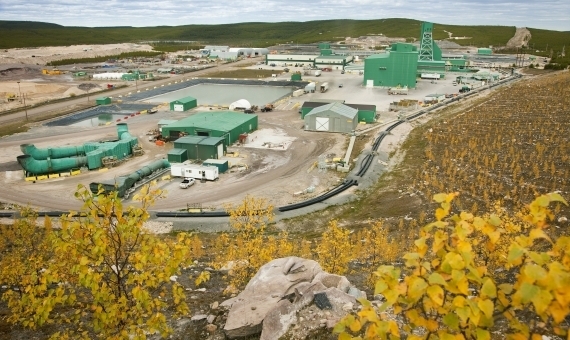 “With the continued state of oversupply in the uranium market and no expectation of change on the immediate horizon, it does not make economic sense for us to continue producing at McArthur River and Key Lake when we are holding a large inventory, or paying dividends out of proportion with our earnings,” Cameco’s president and CEO Tim Gitzel said. Cameco says its can meet its commitments to customers from inventory and other supply sources during the suspension, with its committed sale volumes for 2018 pegged at 28 to 30 million pounds. Uranium prices have fallen 70% since the Fukushima nuclear disaster in Japan in 2011 that shut down the country’s entire nuclear power system, which has only returned at a few power plant sites all these years later. This demand drop was compounded by the German government’s Fukushima-inspired decision to phase out nuclear power. Cameco’s suspension announcement boosted spot prices for uranium oxide, which rose to US$23 per lb. from the desultory US$20 range it had sunk to through mid-2017 — levels not seen since 2004. That’s still a far cry from the spot and long-term prices above US$70 per lb. right before Fukushima. And the 2007–08 peak in long-term uranium prices at US$95 and the even wilder spike in spot prices to US$136 per lb. now feel like half-remembered dreams. Cameco emphasizes that company-wide, it has already lowered supply, cut planned capital expenses, avoided selling into a weak spot market, resisted locking in long-term sale commitments at low prices and significantly reduced costs. Across mining, no one has had a harder past seven years than uranium miners, developers and explorers, and the year ahead shows little sign of improvement. If the subsector’s leader Cameco is having these kinds of grave troubles, we can only imagine what the rest of the uranium pack is going through in closed-door meetings.